It’s not long now until Data Centre World 2017 ‘kick’s off’ at London’s Excel. 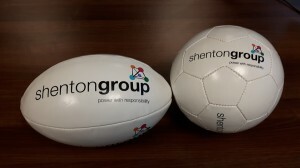 Spanning the 15th and 16th March, if you’re quick enough you’ll be able to score yourself either a shentongroup-branded rugby ball or football. Your choice, but strictly on a first-come-first-served basis! Limited numbers available. Visit Stand A45 to collect your free rugby ball or football, and of course, for your opportunity to speak with a ‘team member’ of The UK’s Leading Technical Experts in Standby Power, Uninterruptible Power Supplies and Combined Heat & Power Systems. We’re feeling especially generous in the run-up to this year’s Data Centre World because it’s shentongroup’s 35th year anniversary. So stop by Stand A45 to find out how we’ve helped countless data centre clients stay online, secure and fully operational in the face of faltering mains power supplies. Who knows, we might even join you for a kick around!